Architects have several ways of surprising the world with constructive innovations and creative explorations. A couple of outstanding architectural works designed by renowned creatives appear to defy the Newton’s law of universal gravity – which states that any two bodies in the universe attract each other with a force that is directly proportional to the product of their masses, and inversely proportional to the square of the distance between them. These buildings perch precariously on the edges of hills, on high stilts, or too-narrow foundations, and are not in any way proportional to their distance between the ground. At first sight, one will wonder how they were constructed, but not to worry, they were made that way – to be unusual enough to top this list. The Balancing Barn stands on the edge of a tranquil nature reserve. It is a few miles inland from the Suffolk coast, near the historic towns of Walberswick and Aldeburgh. The building is covered with silver tiles, the house dramatically cantilevers over the landscape, providing views from its huge panoramic windows over woods, ponds and meadows. The house was designed by the Dutch firm MVRDV. This construction firm has won a world-wide reputation for ingenuity, playfulness and comfortable designs. This museum is located along a mountain pass on the Austrian-Italian border at a height of 2,509 meters. It illustrates the history of the pass and the nearby road. Its open ended structure is a reminder of the function of the surrounding area, which connects two nations. Niteroi Museum is one of Rio de Janeiro’s icons. The Niteroi Contemporary Art Museum was designed by Oscar Niemeyer and structural engineer Bruno Contarini. A flower was the inspiration for this building, thus its shape. Only a few tension cables are keeping Terunobu Fujimori’s “Flying Mud Boat” from crashing to the ground. The cute little hut has an anime feel and can be dismantled and re-installed anywhere in the world. This unusual Wozoco apartment was constructed by MVRDV architects. They explain that the original design for the apartment units didn’t fit the size of the construction. But they went ahead to just put them in, allowing the extra space to protrude out of the building. Rohner Port Building was designed by architectural firm Baumschlager Eberle. The Rohner Port Building can be found in Fussach, Austria. It is meant to evoke a bird standing on thin legs. Fallingwater is perhaps American architect Frank Lloyd Wright’s best known building. It hovers poetically on top of a waterfall. The structure was built in the 1930s, it was so shocking that it was featured on the cover of Time magazine. This tower is located in Hamburg, Germany and housed the brewery that made Astra beer. The gravity defying landmark was eventually demolished and replaced by a less exciting generic office tower. Montreal’s landmark Olympic Stadium is known for the world’s tallest leaning tower (175 meters). It was designed by French architect Roger Taillibert, and looks like a hawk overseeing a clutch of chicks. The Cactus house resembles a giant Jenga tower. It was designed by Ben Huygen and Jasper Jaegers for the city of Amsterdam. Each level of the proposed housing project maximizes sunlight exposure to the balconies, encouraging green vegetation. The “Too High Teahouse” was also created by architect Terunobu Fujimori, who took inspiration from traditional Japanese tea houses. As part of his constructive acclamations, he represented Japan at the 2006 Venice Biennale. Instead of a regular school, Architect Will Aslop decided to build a stunning school with the fun and colorful Sharp Centre for the Ontario College of Art and Design in Toronto. This unusual building balances on thin stilts. 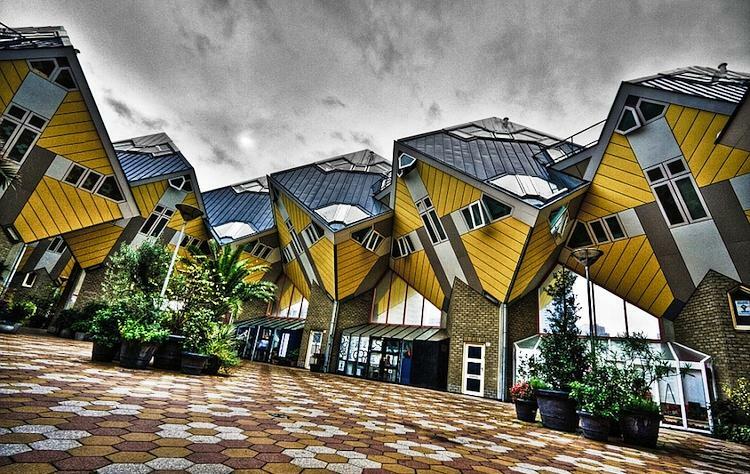 The late Dutch architect Piet Blom designed these whimsical cubic houses in Rotterdam and Helmond, in the Netherlands. The top part of the homes are tilted 45 degrees to create a dizzying effect. This is the most unusual building on this list.